CLEVELAND - Acclaimed rock critic and controversial host of The Classic Metal Show Chris Akin has authored his latest book CAUSE & EFFECT: MOTLEY CRUE due November 24. "MOTLEY CRUE '94 has been the subject of conversation with so many people in my life," states Chris Akin "since the day it was released back in March of '94. That has never waned. Even after all this time, there are people with such hard opinions of it one way or the other. 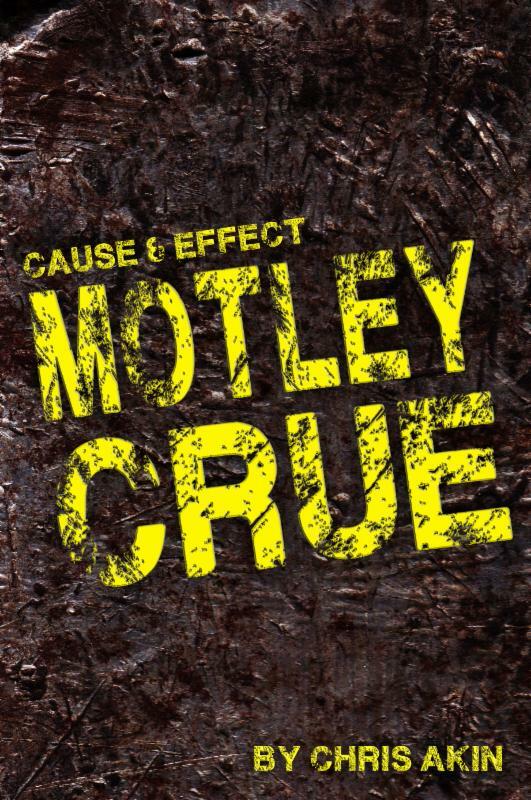 For me, writing CAUSE & EFFECT: MOTLEY CRUE allowed me to share thoughts and feelings about this monumental release with a larger portion of people that still care after all this time. Whether it's remembering personal stories that many of these songs had or revisiting the history of MOTLEY CRUE in their most tumultuous moment, CAUSE & EFFECT: MOTLEY CRUE allowed me to share the experience of one of my all-time favorite releases with the masses." Chris Akin continues his series of cause/effect books. "The first was about Metallica's BLACK album, said Akin. "The other titles I'm working on are about Judas Priest's TURBO, Megadeth's RISK and Nine Inch Nails' THE FRAGILE. I wanted to write these to profile releases that changed something dramatically. With the BLACK album, it changed not only Metallica's fanbase, but how heavy music was played on the radio. With the second book in the series MOTLEY CRUE, it divided the fanbase, as well as leading all their contemporaries down a path that failed nearly all of them. That said, with this album, it's my favorite thing that says "MOTLEY CRUE" on the cover. I think the public just got it wrong with this one." Dallas, TX - JUNE 21, 2017. North American syndicated rock radio show IN THE STUDIO with Redbeard: The Stories Behind History’s Greatest Rock Bands goes one on one with Vince Neil and Nikki Sixx for the sometimes hilarious, sometimes shocking story behind Motley Crue’s four million-seller Girls Girls Girls. A product of the ‘80s Hollywood Sunset Strip, Motley Crue were the quintessential LA hair metal band. Their string of hit albums and crossover songs on radio and MTV was only matched by their over the top live show, mounting legal bills and alarming drug use. By 1987 the band was dancing on a fine line between real life or death. Nikki Sixx and Vince Neil share their stories with IN THE STUDIO producer and host Redbeard. Legendary rock icons Mötley Crüe have, at last, confirmed dates for the highly anticipated Australian and New Zealand leg of their Final Tour, bringing along shock-rocker Alice Cooper as very special guest. My Live Nation pre-sale begins 2pm Tuesday Feb 24. General Sale begins 10am Monday March 2. My Live Nation pre-sale begins 10am Monday March 2. General Sale begins 11am Wednesday March 4. Motley Crue announced today on Fox and Friends the details of their final performance. This will mark the end of their touring career and will conclude their two year Final Tour cycle at the end of 2015 on New Year’s Eve, December 31 at Staples Center in their hometown of Los Angeles where the band’s career began 34 years ago. The band will be celebrating this week’s big announcement with a performance on The Tonight Show on 1/22. After thirty-four years performing together, the 2015 leg of the Final Tour will see the band play Japan in February, then Australia/New Zealand in spring. In June Motley Crue will say farewell to the European Festival circuit with 3 massive performances at Download (UK), Sweden Rock (Sweden) and Novarock (Austria) Festivals before taking their can’t-miss show back to the U.S., Canada, and Mexico this summer for 34 final North American shows due to tremendous fan demand. A special Crüe Year’s Eve LA Travel Package will also be available for the LA show (the band’s Final show)! For more information or to book your travel package call 1-800-Rock-Air or visit MotleyCrueTravelPackages.com. New Crue for your Tuesday...get "All Bad Things", the brand new track from Motley Crue, on iTunes and Amazon. Check out the official video below highlighting Motley Crue's 34 year career! Dallas, TX - Oct 14, 2014. North American syndicated Rock radio show and website InTheStudio with Redbeard: The Stories Behind History's Greatest Rock Bands celebrates the 25th anniversary of Motley Crue's 1989 #1 seller Dr. Feelgood. The '80s was a decade of excess and Motley Crue was its poster child and willing participant. Their reckless abandonment and debauchery has been well documented, but what makes the Motley Crue story so fascinating is that with all the increasing mayhem came an unbelievable string of hit songs and albums. The Crue's 1987 album Girls, Girls, Girls was a #4 seller despite the band's drug and alcohol- fueled crazy existence, but eventually, one by one, the members of Motley Crue all found help for their substance issues. With the newly found clarity, the songs which Nikki Sixx composed and which singer Vince Neil, piledriver drummer Tommy Lee, and guitar monster Mick Mars recorded including 'Kickstart My Heart', 'Same Ol' Situation', 'Without You' and the groove thing 'Dr. Feelgood' blew every previous Motley Crue standard away, notching the # 1 album in America with over six million albums sold. Sobriety didn't stop the party on the road though, but it did allow them to remember it! The Dr. Feelgood tour would become the band's biggest production ever,as Nikki Sixx tells InTheStudio host Redbeard. Mötley Crüe have announced their retirement after December 31st 2015. This summer, their show at Sweden Rock Festival will be their only in Scandinavia. Judas Priest have always received a royal welcome by the Sweden Rock audience, so it is no wonder that their only show in Sweden next summer will be played in Sölvesborg. Toto have been around for 35 years, but have never played the Sweden Rock Festival. Next summer, the wait is over! Backyard Babies put their career on ice indefinitely in the spring of 2010. Soon, they will be back with a new album and their return to the stages will begin at Sweden Rock, where the band has never set foot before. "We are absolutely psyched!" comments front man Nicke Borg and guitarist Dregen. HammerFall, D-A-D and Dark Tranquillity are Sweden Rock audience favourites and we are happy to have them back. Thrash metal legends Nuclear Assault have not played in Sweden in more than 20 years but are now making their only Scandinavian appearance next year at Sweden Rock. Nearly 40 years have passed since the original line-up of Lucifer's Friend played together. The group were pioneers of heavy 70´s hard rock - now they are reunited. With John Lawton (ex-Uriah Heep) on vocals, of course. Also announced are The Angels, Exciter, Rock Goddess, H.E.A.T, Wolf, The Quireboys, Delain, Torsson and Steve n' Seagulls.